RIT Formula Racing placed ninth overall in its first national collegiate design competition in Michigan. Team manager Jon Washington (in car) prepares for one of the dynamic events on the track. The team will continue its season in events in Canada and Budapest, Hungary. 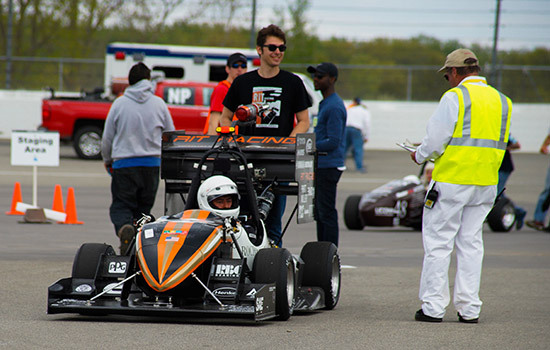 RIT Racing, the Formula SAE race team at the Rochester Institute of Technology, sped to a ninth-place overall finish in Formula Student Michigan at Michigan International Speedway this past weekend. Formula Student Michigan is the largest and most prestigious national collegiate design competition in North America, and RIT Racing was among 125 international teams from universities in the U.S. as well as Canada, Austria, South Korea, Singapore, Germany, Mexico, Venezuela and Brazil. The team also took top-20 placements in the autocross and endurance events and received a team design award for one of its engine systems. RIT Racing placed seventh in the endurance race event, with a best lap time of 58.586 seconds—just off the best overall time recorded by eventual winner, the University of Stuttgart at 52.794 seconds. Part of all competitions include design presentations, detailing the work that goes into building a competitive racecar and the integration of automotive technology and systems. This year, the team incorporated several new features into its car, many designed and built in-house including an advanced engine control unit, electronic throttle control, drag-reduction system and braking system. RIT Racing was recognized with the MacLean-Fogg Fastening Challenge Award and $1,000 stipend, given to the team that best solved a component fastener challenge using engineering tools and skills. RIT Racing will continue its season June 1-4 at Formula North in Barrie, Ontario, Canada, where it will enter two cars: its traditional gasoline-powered model, F25, and its first all-electric model, E1. The team will head to Budapest, Hungary, later this summer to compete for the first time in Formula Student East, as the only American entrant for the competition taking place July 20-23 at the Euro-Ring Circuit. More than 115 collegiate race teams from 28 countries are expected. RIT Racing is currently ranked 38th in the Formula Student Combustion - World Ranking List among more than 550 international collegiate race teams. The current rankings reflect 2016 competitions to date and will be updated as the 2017 season continues. Rankings are based on points at events over three seasons.